3 months in, it’s time for taking stock of the activities that have marked the beginning of our collective explorations of ‘the explorative exhibition’. In late May, the 7 person project team – i.e. the people managing exhibitions, collections, research and education at Enigma Museum + me – went on tour to my old project-partner museum, Ragnarock. The idea behind the excursion was to give the user perspective a central role in our project by making that our starting point: being users and potential contributors in another institution. Hence, despite the obvious differences between the two museums, Ragnarock is also an interesting parallel to Enigma in that both relate to contemporary, everyday culture, and both seek to engage the public in collating their history as a polyphonic narrative. Moreover, Ragnarock’s take on interactive exhibition design could serve as a common reference in future discussions, whilst the problematics of the ‘rockspor’ site would remind us of the challenges of designing for participation. Rethinking ways in which to engage with our own musical history was therefore the challenge in the afternoon workshop. In preparation, I had asked to team to respond to a ‘proto’ probe on this theme – originally designed for the Ragnarock project – as a means to tune in and reminisce, but also as an introduction to this particular method as a potential tool in our continued process. The workshop itself, however, was structured around the Stanford d.school crash course in design thinking. This format takes you through the stages of a design thinking process in just a couple of hours: building empathy through interviews, defining a problem statement, ideating and iterating solutions and finally building and testing prototypes. The point of the exercise is thus not to come up with solid solutions, but rather to get acquainted with the basic ideas of design thinking (as formulated by the d.school; there is a wider spectrum of methodologies related to design thinking, which again relates to human centred design, and to the Scandinavian traditions of CoDesign and Participatory Design, as argued by Björgvinsson et al. . For an extended presentation of how design thinking may be applied to a museum context, see Dana Mitroff Silver’s MW2013 paper). The purpose of the workshop was mainly to work as a warm-up exercise for the design work ahead, and therefore, more than the team’s innovative idea sketches, the most interesting thing for me to observe was the power of prototyping, as I sensed a palpable rise of energy and buzz of productive playfulness when we shifted from pen and paper to making mode, even if the prototyping materials were pretty basic. So even though the ensuing discussion (along with bringing up points about the craft of interviewing; the pros and cons of time pressure; and an interesting observation about memory as a social construct) also stressed the need for building more knowledge and clarifying our design intentions before launching into production mode and engaging users, to me the workshop also illustrated how ideas and understandings are also constructed in the making process. In my thesis, I built on Hastrup’s idea about research as a process of ‘ontological dumping’, in which relational understandings of the world are transformed into objects of knowledge, to describe how the design process similarly lets understandings of the problem field become substantialised in the form of suggested solutions (Hastrup 2006:3; Baggesen 2015:55). This notion could be a heuristic for the continued process in this project, which also aims to explore how design methodology affects museum development processes. Following on from this, workshop 2 focused on clarifying the museum’s intentions. But, to stick with the methodology angle, let me first make a note about the workshop space. As noted earlier, Enigma Museum is still in-the-making, raising money and making plans for future exhibitions while experimenting with other ways of being a museum, e.g. through events, external collaborations, pop-up exhibitions and media presence. From a museological point of view, this process and these experiments are fascinating to follow. But another upshot of this limbo state is that the museum still has space to spare, meaning that I could clear a corner of the provisional storage floor to set up a workspace for the project. Being able to furnish it with an old mahogany table set once used by the museum board was a scoop, adding a symbolic meaning of having a mandate to make decisions, whilst also lending some definition or solidity to the makeshift space. In practical terms, the space also gives us walls to mount our work-in-progress ideas and inspirations on, and, most importantly, gives the project a (temporary) permanence and physical presence, a place to go to go into project mode and pick up from where we left off, rather than having to re-establish the project arena, conceptually and materially, every time. In a sense, therefore, establishing this workspace is a very literal, spatial response to the argument made by Björgvinsson et al., that “a fundamental challenge for designers and the design community is to move from designing ‘things’ (objects) to designing Things (socio-material assemblies)” (2012:102; insert brackets in the original). This Latourian idea (playing on the shared etymology of the word ‘thing’ and the old Nordic democratic institution the Ting/Thing) of the design (research) process as an assembly of people, artefacts and ideas gathered to address pertinent matters of concern, is one I also pursued in my PhD project, and a fundament for my continued research. The current project is thus also a gathering together of people and interests with the dual objective of creating both museum development – designing a new format for collection and mediation – and museological research – exploring matters of concern. To this end, moreover, I will also be designing a collection of methodological tools or design things, such as probes, personas and concept/dialogue cards to assist the process. In many ways, I would like to expand on the methodological considerations I explored in my dissertation, and pursue this design theoretical track also in this project, but do I really have the time to go out on a theoretical/methodological limb about design things/Things? Is it relevant enough, in this context, and is the project strong enough to sustain a valuable contribution in this field? Of course, if I focused my energy here, I could make it so, but then my primary interest in this project is to provide a real, useful contribution to the museum’s ongoing development process. Still, the project needs to encompass both the academic and the practical. So, should the continued project process focus on efficient design of realisable prototypes ready for testing in the foreseeable future, allowing me to complete an empirical study of user responses, as suggested by one senior researcher in the programme? Should the process focus on staging discussions in the project team, allowing me to elicit and explore more nuances in the museological matters of concern, or even testing and challenging the convictions and rhetorics of the museum, as suggested by another? Is my main contribution to the museum the development of a ready-for-production mediation concept, or an experiment in methodology to fuel future work processes? Am I a catalyst, a facilitator, an evaluator, a critic or a team member; an insider or an outsider? All of the above, perhaps? So, it’s a balancing act, pursuing academic objectives and development objectives at once, while also juggling museum realities and pragmatic project constraints as I plan for the next stages of the project. Negotiating different or even conflicting objectives, ambitions, constraints and concerns was also a theme in our second workshop, focusing on our design intentions. To begin my research, I had earlier conducted a series of short, individual interviews with the project team members in order to establish some kind of baseline of the project before setting off on our joint expedition. As expected, their ideas and concerns were overlapping but also quite diverse in terms of what they saw as the primary aims of the project and of the exhibition ‘mechanism’ projected as the intended result. It was therefore necessary to stage a discussion of these different perspectives to get a joint idea of the scope and discuss conflicts and commonalities, and to see if we could reach an agreement on our design intentions. The discussion was both constructive and inspiring, and provided relevant material for analysis in relation to the Our Museum dimensions, even though we didn’t succeed in arriving at a singular objective. Still, from a rough analysis of the video documentation and post-it notes from the session, I could distill a provisional ‘wishlist’ of intentions, including the wish to co-create a polyphonic history of communication with our users; to create identification and foster ownership and empowerment; to engage users in our research; and to create inspiring, iconic, and innovative exhibition experiences. Of course, this still reads more like an idealistic mission statement than a concrete design brief, but these grand objectives are also relevant as guidelines in our continued process. And of course, the discussion also pointed to many aspects that were still unresolved: whether user contributions should feed into research, or exhibitions, or both; whether participation should function as a means for collecting or as a didactic strategy, or both; how to handle incoming data and materials; how many ressources this kind of strategy would require, and how many the museum is able or willing to spare; and, of course, whether and how our users would want to participate. In the continued process, we will try to find answers to these questions through exhibition experiments and user engagement. In parallel, however, we will also try to understand these issues through discussions of museological theory. So far, we’ve had two study group sessions; one focusing on participation, with texts by Nina Simon, Pille Pruulmann-Vengerfeldt & Pille Runnel, and Bernadette Lynch; and another on museum missions with readings of Duncan Cameron and David Anderson, along with the (re-published) Musetrain Manifesto, Orhan Pamuks Modest Museum Manifesto and ICOM’s Cultural Diversity Charter. Now, I’ve had to realise that I have been a bit over ambitious with the quantity of reading, but apart from that, this experiment in bringing museological theory into museum practice has proven to be very inspiring. Realising (with initial disbelief and then som disappointment) in the first year of my postdoc how little academic museum research is used in museum practice (I know, practitioners are very busy, and academia can be a bit too cerebral, still it seems such a waste of effort and potential), I am quite excited to have met such a positive attitude to the idea in Enigma, and to see that it does seem to make sense to infuse practice with theory, to provoke discussion and build up a shared set of references and ideas. Hastrup, K. (2006). ‘Designforskning: mellem materialitet og socialitet’ [’Design research: between materiality and sociality’]. Copenhagen Working Papers on Design. Copenhagen: Danmarks Designskole. Silvers, D.M. et al (2013). ‘Design Thinking for Visitor Engagement: Tackling One Museum’s Big Challenge through Human-centered Design’. Museums and the Web 2013, online proceedings. Toronto: Archives & Museum Informatics. Tuesday was the day for the workshop with my four informants and new-found favourite ladies: Cecilie (budding designer and fashion blogger), Stine (digital strategist for Burson-Marsteller), Judi (stylist and former art educator at SMK) and Nanna (media researcher at DR with a past in the fashion industry), not to forget Line, a fellow PhD-student (Dream/Rockens Danmarkskort) who generously offered to observe and document the session. It was perfect. I’ll elaborate in a minute, but first of all I really want to express my excitement about and gratitude for their engagement and contribution, for the insights, ideas and opinions they shared and for the discussions we had. I left feeling high as a kite, truly inspired and completely spent. My objective for the workshop was not so much data collection as generation of inspiration for my upcoming design process, and I expected to come away with a stack of post it-notes full of random ideas and a bundle of notes, viewing the video- and voice recordings merely as a backup. However, as the session progressed, and evolved more strongly as a discussive focus group than as an ideation workshop (I had prepared a guideline schedule, of course, but played it by ear, to allow for the session to flow and for the most fruitful discussions to flourish), it became clear to me that the discussions we had were so rich, that it would be a shame not to include them as data. Of course, I am well aware that I will not be able to generalize anything from the views expressed by such a small selection of people, who furthermore cannot be seen to be representative of a wider user group. Indeed, as I discussed with Line afterwards, they were more like experts, having either professional insights into and experience with social media, fashion and museum work or educational backgrounds that informed their perspectives. On top of that, they were also all passionate about the topic as well as demonstrating high levels of reflection. So no, they weren’t your average user, but then their expertise allowed for the conversations to reach a different level, leading to exchanges that may not serve as proof, but which perfectly illustrates some of the challenges in this field. And then again, they were also ‘just’ prospective users with personal – and sometimes self-contradictory – views, preferences, habits and experiences. First up, the informants were asked to evaluate their experience with the probes. They all agreed that the presentation of the probe package was appealing and that the tasks were fun. And that what they really enjoyed was the analogue-ness and tactile quality of the tasks (the use of the term ‘analogue’ is an example of how this group had not only personal experience with, but also a detached perspective on and vocabulary for discussing new media). As so many other things in their professional and personal activities involved the use of a computer, the probe represented a nice change from that. Also the analogue tasks were easier to dip into, whereas the digital tasks – that most participants had avoided – felt cumbersome, timeconsuming and somewhat forced. Asked if they saw this as a general /potential barrier for participation in museum set tasks on social media platforms (e.g. collective Pinterest boards) they concurred. As Nanna pointed out, rather than trying to design for interaction on their own platforms or even their own domains within existing social media platforms, museums should try to engage in the conversations and streams already in flow. As for the museum visit, only Stine had gone (Cecile had already been before the interview took place), whilst Nanna and Judi explained that they had not been able to fit it into their schedules, as a museum visit is a considerable activity. As Stine had downloaded and brought along the Designmuseum mobile app, this lead to a discussion about the need for any mediation tool to truly add value to the visit, and the often misguided predeliction for developing apps, when a mobile optimated website would have been a better option. Following on from this evaluation, the informants were asked to spend five minutes noting down their immediate thoughts on and ideas for the the topic individually. After this, I did a brief presentation of my project (field, questions and research design), and an introduction to some of the perspectives that could inform one’s thinking about the field accompanied by visuals. The participants asked good questions into my research interests and hypothesis, however, as the concepts introduced in the presentation were not taken up later in the discussion (one of the reasons for presenting my project was to establish a shared understanding and some communal references, as well as clarifying what project they were part of and how) perhaps this presentation was too long. Next came a discussion of the potential users and their context dependent motivations for visiting museums or pursuing their interest through other means, exemplified by the five museum types suggested by John Falk (in Drotner et al 2011: Det Interaktive Museum): The enthusiast, driven by a specialist and perhaps professional knowledge and interest; the experience hunter, seeking out the ‘big game’ cultural hotspots; the explorer, searching for delightful discoveries; the facilitator, focusing on making the visit a succesful social event; and the escapist, using the museum to recharge or find spiritual meaning. My intention with this excercise was to inform my future development of personas to design for, but the discussion led to little tangible information about the specific types. I even tried provoking the issue a little by asking what these types would be like as superheroes, but that didn’t turn out super useful. Instead, the participants’ sentiment echoed the point made by Falk; that these are more like roles than types, ones you dip into and out of or find yourself in, depending on your life situation and the context, company and topic exhibited. Overall, however, they would rather design for the enthusiast and the explorer than for the other types of motivation (as would probably most museum educators). What do we want to be social about? When I interviewed Stine before the summer, she told me that one of her key points when advising about the development of social business models was to ask yourself the question ‘What do we want to be social about’? (unfortunately I can only come up with this poor translation, that is a lot clunkier than the Danish ‘Hvad vil vi være sociale omkring?’. ‘What is our social object?‘ sounds better, but I’m not sure if that is quite right either. Thoughts, Stine?). This question has lingered with me since, and inspired the next exercise on the potential for and value of social interaction between Designmuseum Denmark and its users. Again, the consensus was that the museum should try to socialize where the social interaction is already happening. Aggregation of content, via algorithms trawling for #tags for instance, was deemed a viable approach, if only you could get people to agree on which tags to use [this idea is reminiscent of the Twitter concept being developed by SMK, see presentation by Merete Sanderhoff at MuseumNext ] Another suggestion was some sort of personalization, turning yourself into an exhibtion (like the FB timeline precursor ‘Exhibition of me’), and playing to the narcissist in us all by displaying the feed of ‘#todays outfit’ etc in the museum. The concept of ‘second screen’ (and how the second screen sometimes became the first, as the online conversations around a given program were what pulled you in, rather than the program content itself) was discussed (again a professional terminology). Other inspiration sources included GetGlue, iPhotoCap and #fredagsbog. Asked what the museum could contribute to the conversations, both Judith and Cecilie agreed that they could show another side to the fashion story than what is usually presented in fashion media. Judith brought up a great example in the subversive photographs by artist Jens Haaning, with captions describing the outfits mirroring those of fashion shots. Another wish was to be able to access and play with a digitized version of the museum collection, mixing new looks etc. This idea somewhat contradicted the agreement earlier on that the museum should join the conversation rather than try to set new tasks. A suggested solution for merging the two, i.e. to attract users to a new ‘service’ was to learn from the way Spotify entered the Danish market by way of Facebook. I took this as a cue to introduce an excercise I had been a little uncertain about, knowing that focusing on the platforms can detract from the question of content and motivation. 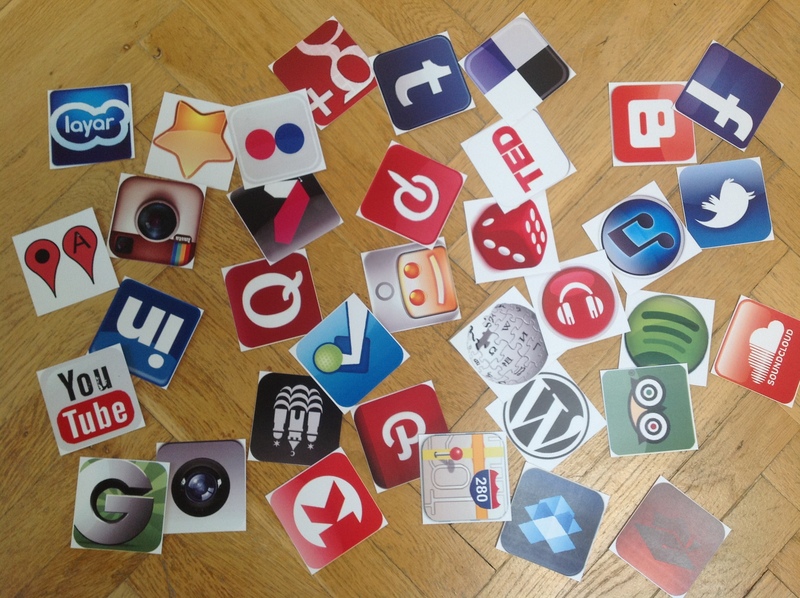 However, as it turned out, the conversations prompted by the social media symbol cards were very interesting. The key, of course, is deciding what you want to achieve, understanding – asking? – your users and then choose the appropriate platform. The participants did however gravitate towards Instagram, Facebook and Twitter, again arguing that this is where the users already are. Whilst some enjoyed using Path, it was still a small community of private parties, and Flickr is loosing ground with the growing popularity of Instagram. As for YouTube, the group seemed to agree that perhaps a private channel would be preferable. As I was keen not to forget the non-sociable aspects of mobile media, and tried asking if perhaps a podwalk or similar would be an interesting way to go. The idea was quickly rejected however, as Judi pointed out that musical soundtracks for exhibitions were rarely adapted. Perhaps all the talk about social interactionn also made it hard to forget that focus during this workshop. Gamification, as examplified by Foursquare, was also debated, yet, as fashion has no geolocation, it was hard to see how this concept would apply to this field. After a short break, in which the conversations continued, we moved on to the ideas-generation part of the workshop. The initial thoughts, written down in the beginning of the workshop included questions on how to bring the ephemeral into the museum, how the museum can share its treasures without needing you to come to the museum, and how everyday fashion and not least the personal relationship with fashion can be brought into or exposed through the museum. Cecilie came up with an idea for displaying honour plaques around town to commemorate significant fashion events (think ‘Here, in 1964, a Mary Quant costumer first wore the mini-skirt’), which was well received and elaborated on by the group, and also suggested a public photo booth where people could have their outfit photographed for the museum collection (if people were willing to have their photos taken in ‘Kussomaten‘, it is likely that you could get them to contribute street style shots for a historical collection as Stine commented). However, as Judi pointed out, such contributions would also require a lot of editing on the part of the museum, to ensure quality, which again would raise the question of who has the authority to select, and what happens to the multiplicity of voices when they are censored. Still, the museum should have an expertise that is different from that of the magazines or the bloggers. Another important contribution from the museum, as defined by the group, is the great narrative – tying information together to form a story, an argument, a unison – something that you won’t necessarily be able to piece together yourself out there on the internet. And overall, they were more interested in the material culture in the museum, the chance to experience e.g. a variety of fabrics or building materrials, than in a digital overlay. DAC and the Danish Designcenter where brought forward as examples of this type of exhibtion, whereas Designmuseum Danmark (which holds a substantial textile collection, that was originally collected with that kind of use in mind) was perceived as being a bit old fashioned. Even the prospect of the development of a museum for fashion within DMD was regarded with some scepticism. Louisiana, on the other hand, seemed to be everyone’s favourite museum, and was mentioned on numerous occasions. And so, after three hours of passionate banter, the workshop came to a close, and with the help of these great characters, I had collected a rich material to inform my continued investigations. As Stine pointed out, it would have been interesting to have been able to see what the other participants had contributed via the probes (and so we ended the evening with a visit to my office to marvel at the wall). I had not fascilitated this knowledgesharing, and not even invited by participants to respond to the blogpost I made about the returns. Good point, and I do apologize! 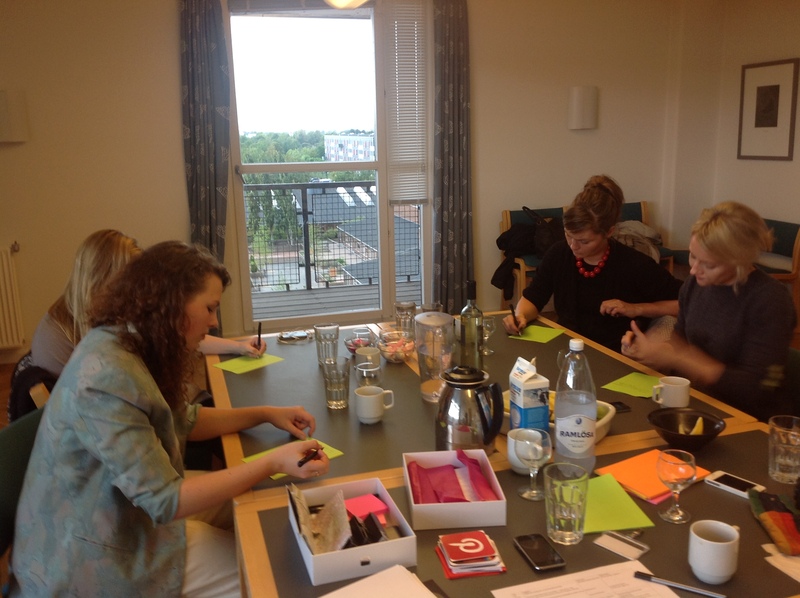 And please, Stine, Judi, Cecilie, Nanna and Line – if you can spare a moment and have a comment on how you experienced the workshop or have had other thoughts on the topic since then, do drop me a comment here. It would be great to hear from you! And be warned that I will probably contact you again when I’ve come up with concepts that need scrutinizing by you expert minds (but don’t worry, I won’t hold you to your declaration of interest, feel free to turn me down if it’s no longer relevant for you).